SABIC is presenting an innovative new transparent high-heat LEXAN™ CXT film product at the IDTechEx show in California. The new polycarbonate (PC) based technology combines superior optical clarity and high design flexibility with excellent thermal and dimensional stability at elevated process temperatures. 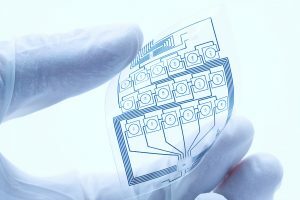 The material was specially developed to provide a high-performance and cost-efficient solution for substrates in the rapidly growing flexible printed electronics market as well as for other applications exposed to high processing and/or in-use temperatures. “Substrates are an essential yet often neglected layer in many flexible printed electronic applications and can place undesired limitations on the production process when it comes to heat resistance,” explains Mr. Ravi Menon, Global Business Manager Film for SABIC’s Functional Forms business. “Our new high-heat LEXAN™ CXT film has been engineered to overcome these constraints while at the same time offering excellent transmission, low haze and clarity compared to traditional high heat films. LEXAN™ CXT film has a glass transition temperature of 196°C, which opens a wide manufacturing window to meet the required dimensional stability in thermally more demanding processes where higher process temperatures are required. Moreover, the latest addition to SABIC’s extensive portfolio of high-performance thermoplastic films exhibits the outstanding formability customers can traditionally expect from a cost-efficient LEXAN™ film, thus also providing high design flexibility for flexible printed electronics substrate and other applications relying on accurate pattern transfer. At a typical thickness of 50 µm, LEXAN™ CXT film shows superior light transmittance (up to 90%) as well as extremely low yellowing, particularly over incumbent polyimide products. These features together with low haze make the new film an ideal candidate for applications that must ensure long-term and glass-like transparent clarity. Besides substrates in flexible printed electronics, potential applications for LEXAN™ CXT film also include laminated structures, such as conductive layers for high-end touch screens and other device displays, as well as high-heat resistant transparent thermoformed trays for component annealing or curing processes in the semiconductor industry. The new high-performance thermoplastic film product has successfully passed both internal comparative testing and strict customer evaluation trials, and will be commercially available worldwide. SABIC is officially introducing LEXAN™ CXT film to the market during the IDTechEx 2018 show at the Santa Clara Convention Center in California. From November 14 to 15, visitors are encouraged to stop by and discuss the application fit of this and other material innovations with the company’s specialists at Booth Z31. SABIC has developed an innovative new transparent high-heat LEXAN™ CXT film product designed to provide a high-performance and cost-efficient solution for substrates in the rapidly growing flexible printed electronics market as well as for other applications exposed to high processing and/or in-use temperatures. Kevin Noels (knoels@marketingsolutions.be, +32 3 31 30 311).